Every time Pattern Review has a Wardrobe contest, I love perusing the storyboards of the participants and dreaming up my own mini wardrobe. It's so inspiring to see how other sewers interpret a pattern and fabric choice. And for me, there is something so fun about taking all of my patterns, spreading them out and then taking my fabrics and laying them alongside the patterns and matching them all up. I consider it the sewing person's version of Sudoku- at least that's how I try to explain it to my husband. For this months project I chose four fabrics to mix and match and make a mini wardrobe. I noticed a lot of yellows on the Fabric Mart site and was enamored with a couple of prints that I found intriguing. One print I pulled from my stash and it is- lucky for you!- still available on the site. As I was choosing my fabrics I double checked with Julie to make sure that they coordinated as I envisioned they would and she was able to steer me toward some combinations that worked better than others, that's always soooo helpful when choosing fabrics online. I am kind of an eyelet nut, I love, love, love anything eyelet so when I started planning my mini wardrobe I chose this yellow eyelet as the foundation of my collection. The eyelet is a Maggy London fabric and is available here. This a beautiful eyelet, great quality, and not only am I an eyelet nut I am also an eyelet snob, I will not sew with cheap eyelet. I made that mistake once with an Easter dress for my daughter and I was so perturbed when the eyelet pattern snagged on everything and began to unravel from the fabric. Therefore, if I detect a cheaply made eyelet I will just do without rather than spend my time lovingly crafting something only to have it poop out after one wear. This eyelet is the good stuff, no worries about snagging the pattern. 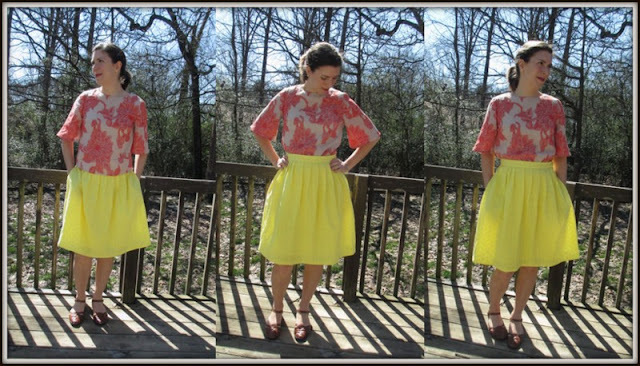 The pattern for the skirt is a Simplicity Cynthia Rowley, number 2215. This pattern doesn't include a lining piece so I jimmied one myself, can't say that I recommend my method, but it worked for me this time! Next time I need to properly reference a book on constructing a lining but for this one I folded out all the pleats and cut a front and back shape roughly the size of the skirt minus some of the pleat volume. It gets the job done and still looks decent on the inside. The pockets on this pattern are a great addition and the construction for the invisible side zip with the pocket are great. The top for this look is McCalls 7285. The fabric is a really beautiful J. Crew cotton/linen voile. It is very sheer so lining it is a must- that is unless you make an awesome kimono from it or a shell top and pair it with a silk camisole! It is a very light and airy fabric- it floats like a voile, rather than puddling like a challis. I lined the bodice with a poly lining and left the sleeves without lining. I love the abstract botanical motif on this fabric and the print works great with this skirt. If you can believe it this fabric is only $3.00 a yard, found here. Here I am again, about to sound like a crazy saleslady, but I love the fabric I used for this top. It's a cotton/poly jacquard by Maggy London and its a steal at $1.99, found here. I picked some of this up awhile back for apparel and when it arrived I immediately ordered a bunch more for curtains! I love a floral jacquard and the coral color is one of my favorite colors. The beige is sheer so I used a lining for the bodice but left the sleeves without. The pattern is Butterick 6175. I used the view with the bell sleeve and I love the way this top turned out. Does your photographer ever say "hey you have a long string on you" and then snap your picture? Mine does, but its a great way to show off the shape of your sleeves!! This is my husbands vote for favorite look. 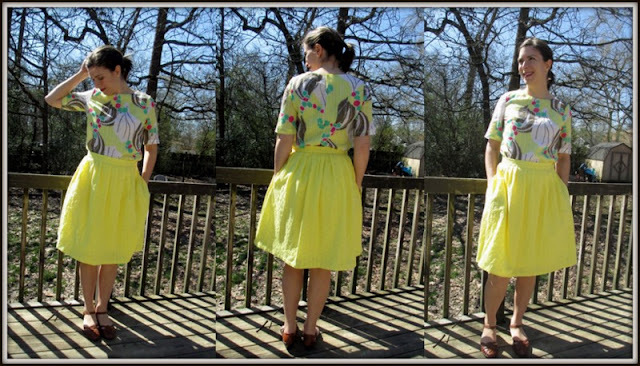 The fabric for this top is another Maggy London print, and is found here. It's a poly twill, which I wasn't quite sure what that would mean when I chose it, but it's a thicker fabric than the others used here and has good drape as well as a slight stretch. The cut edges do fray a bit so you will need to serge, zig zag or use pinking shears to finish them I did a little of it all when making two garments from it. The pattern here is Vogue 9109. I've used this pattern before and was excited to envision this fabric as this tank. Now this is where I need the most help from all of you...I am not sure if this outfit is a success or a big old pattern fest...help!? Can I wear this out or is it just way too much for the eye? My husband says, "ummmm its nice." Which is sweet, supportive husband speak really means "oh dear me, please don't let her wear that on our next date, please God please." After looking at these pictures I like the look, I do think it might be a bit much for a small town girl, but I'm ok with looking a little different. On a side note I am teaching my dog, Buster, to talk when I say "speak" and I asked him for his opinion since he was so determined to photo bomb my pictures (and he's usually so camera shy!). The first time I asked he smiled at me, the second time I asked he refused to look me in the eyes....not sure how to take it. The culottes are McCall 7133 and I like them pretty well, I turned the box pleat into a single pleat, just a personal preference. I suspect they need a little more back crotch length because they pull weirdly to the front a smidge when I walk. The fabric was a good choice for this pattern and I could see this fabric being used for any number of culotte patterns that are now out there. 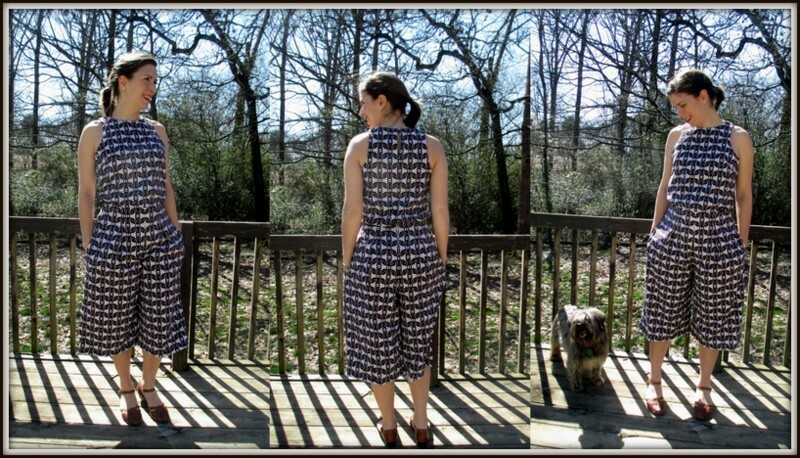 As far as a culotte pant, this pattern is a very easy pattern to sew and has center princess seams down the middle back of each leg. I also added pockets. I know when you're avoiding me Buster! There's not much to say here that I haven't already said but I love to print mix and although these two might not be a perfect match I'm good with them! Again not much to say here except, I hope this culotte trend hangs around for a few years because they are really comfortable and easy to sew. One thing to note, I'm planning to sew so many pieces in a short amount of time I purposely chose patterns that I felt were very easy to sew. So if you are a beginner I'd recommend each of these patterns. There aren't many pieces involved, probably the culotte had the most pieces and the shapes are pretty forgiving. 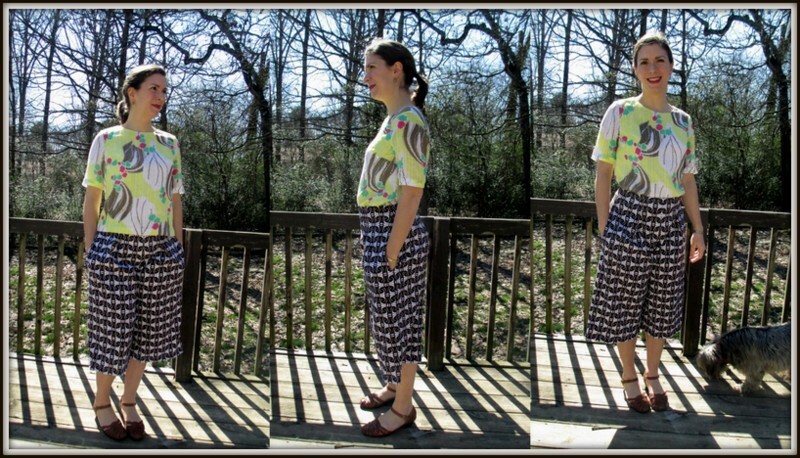 Well that's my Mini Spring Print Mixin' Wardrobe and I hope I've inspired you to try your own! I am thrilled with the results. The fabrics were beautiful to work with and now I am all set for the Spring! Yippee! All of your outfits are adorable! And I love the coulottes and matching top together. Right up my alley. Thank you so much- I had so much fun matching them up! 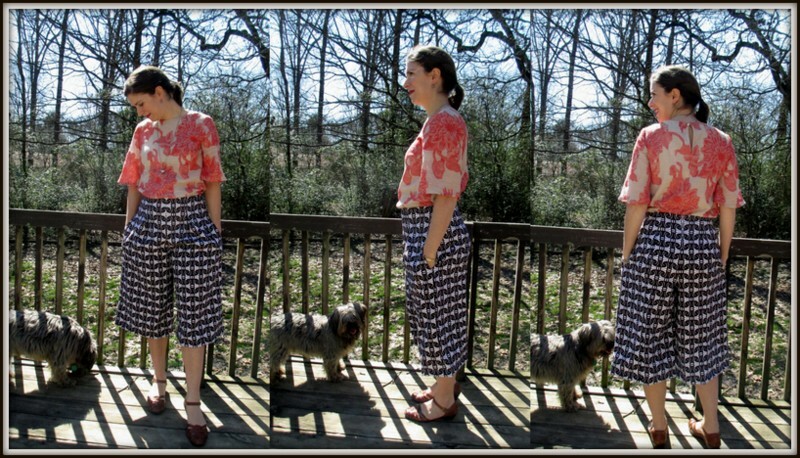 It helps to hear that the matchy matchy culottes and top are good together! Thank you so much for sharing your style choices online. I love your yellow skirt! It looks so happy. I think i'd like to try a happy look as well and have a major piece to mix and match with in yellow. I like the way you showed how you mixed and matched to get numerous outfits too. I am so glad you like the post! It always helps me to see what others are matching up and its one of my favorite parts of sewing! The yellow eyelet is a really happy fabric, I hope you have fun coordinating your happy pieces together too. Adorable! You chose some beautiful fabrics too! Thank you so much Ann! Its so fun to mix and match fabrics. Fantastic! I love your stylish way of mix prints and colours. Your wardrobe is very inspiring as I'm also into mixing prints lately. Thank you Maya! I am glad the post was inspiring- that is the best compliment! I will look forward to seeing what you mix and match in the future. So, I'm a year and 2 months late to this post. I hope my 2 cents still has some value.. My absolute favorite outfit is the print top and matching culottes (#4).. One way to save the outfit and break up the pattern is by adding a nice belt (something fairly wide with a large buckle) and a cute pair of sandals. Your pattern matching skills are AWESOME!!! Love, Love Love this outfit... It almost looks like a jumpsuit (which are cute but impractical when you have to go to the ladies room.) This look gives the best of both worlds. KUDOS to you...You are an inspiration...even a year later!!! I am so glad that you posted even a year later :) What sweet words, thank you so much and I am so glad that my post was inspiring!! I appreciate your suggestions, I have worn a lot of these pieces mixed and matched with so many other items and you are so right about the jumpsuits, I have a small bladder which means many bathroom runs and no mam, I am not fiddling with a jumpsuit! Glad you stopped in and commented!! Thanks!